Tessa wakes up at moonset, just before sunrise. Mom, Dad, and sister Maggie are still sleeping. Borrowing a set of wings from the butterfly mobile above her crib, Tessa floats over the floor, performing loop-the-loops and backflips. Tess dives down to give Maggie's forbidden blue elephant a wild ride on her push toy. She uses Maggie's polka-dotted umbrella to drift down like Mary Poppins. Spying Maggie's books, she pretends to read to her dog Bingo. But with his tail Bingo knocks over the tea table Maggie has built with her blocks. The jig is up! Fast she can, Tessa tidies up and soars back into her crib, just as a sleepy Dad comes to investigate, turning on the light to see Bingo in the middle of a big doggie yawn and Tessa bouncing in her crib. ("If only you knew....") thinks Bingo! 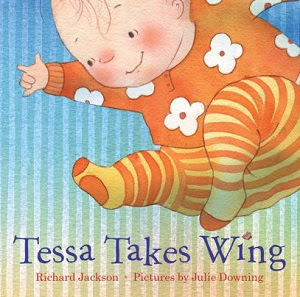 The noted Richard Jackson's latest picture book, Tessa Takes Wing (Roaring Brook Press, 2018) is a delightfully designed fun fantasy about a baby who is definitely a morning person, one who relishes early solo expeditions on the wing. Julie Downing's jolly illustrations of the lighter-than-air Tessa are whimsical excursions into fantasy with great good humor and sight gags such as the flock of butterflies that flutter around Tessa whenever the grownups are not there. Bingo even grabs the bottom of one of Tessa's footies, pulling her pajama bottoms down to show her diaper decorated with--what else?--butterflies. Says Publishers Weekly, "More poem than story, it's also a wonderful reminder that everyone is capable of a rich fantasy life."